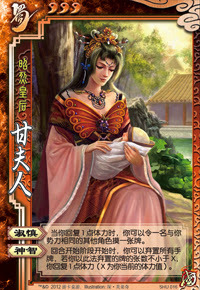 At the beginning of her turn, Lady Gan can choose to discard all of her hand cards. If she discards X or more cards in the process, she regains one unit of health. X is how much health that Lady Gan has. For each unit of health that Lady Gan regains, she can select two characters and each draw a card. "Care and Caution" is activated before Lady Gan's action phase. She can select herself for one of the two characters. If Lady Gan suffers damage in such a way that she needs multiple Peaches to recover from the brink of death, she can activate "Wisdom" for each Peach that is used on her. She can select two characters to draw cards even when she is on the brink of death (she does not need to wait until she is fully recovered to one unit of health). However, if she selects another player that has already been prompted to play a Peach for her, they cannot use Peaches that they may have drawn from this ability to save her. "Care and Caution" and " Wisdom" work very well together. She can easily heal herself and allow her team to draw two cards with these abilities on a consistent basis under the right conditions. "Wisdom" works well with healing characters. This opens up a lot of team possibilities with Lady Gan. "Wisdom" essentially gives Peaches a dual function of also acting as Draw 2s (with the minor difference that two people draw one card instead of one person drawing two cards). While "Care and Caution" is useful and allows Lady Gan s team to draw cards, can be quite expensive as it requires Lady Gan to discard her entire hand. This is not a big deal if Lady Gan s hand card number is equal to the number of units of health she has remaining, but it may put her at a disadvantage if she uses this ability when she has many cards in her hand. Lady Gan has nothing to offer her team if she is at full health, as she cannot activate either ability to allow her team to draw cards. Experienced players would be able to exploit this weakness by ignoring her until her teammates are finished. Due to the card-intensive nature of "Care and Caution," Lady Gan is susceptible to card destruction techniques. This may just be a quirk in the programming of QSanGuoSha, but since Lady Gan must select two characters to draw cards when she activates "Wisdom," she is weak in one-on-one battles, as she must allow the opponent to draw a card when she activates this ability. Hua Tuo/Wu Guo Tai/Cheng Pu/New Xu Shu - These characters have abilities that allow them to easily heal other characters. This can allow them to help Lady Gan to easily activate "Wisdom." Liu Bei/Xu Shu/New Xu Shu/Xun Yu/Guo Jia - These characters have abilities that allow them to either pass cards to other characters or allow other characters to draw cards. These abilities are useful for Lady Gan as they allow her to more easily activate "Wisdom." Zhang Liao/Gan Ning/Zhang He/Jiang Wei/Deng Ai - These characters specialize in card destruction and can make it difficult for Lady Gan to activate "Care and Caution." Jia Xu - Jia Xu's "Complete Kill" prevents Lady Gan's teammates from saving her from the brink of death with a Peach, which will rob her of the ability to activate "Wisdom" to help herself and her teammates. King Lady Gan seems to be a serviceable king choice, especially with aggresive rebels. Her abilities allow her to more easily stay alive and help her team. However, the rebels can pick characters who specialize in card destruction and throw a wrench in her plans. Loyalist Lady Gan is a weak loyalist. When the rebels discover her identity, they will not pursue her and instead focus their efforts on the king. Rebel Lady Gan is probably best as a rebel. Even if more experinced players know about her weakness, the three-card bounty is difficult to resist and Lady Gan will probably be damaged so she can use her abilities to help her team. Spy Lady Gan is a poor spy. Since she is a low priority of the other characters, she will probably not be damaged as often for her to activate her abilities. Also, she must always pick another character to draw a card via "Wisdom," which is a significant drawback since she has no official team. The programmers of QSanGuoSha actually made Lady Gan more powerful in this program than she is in Kingdom Wars, but she seems to be pretty weak. We are not very familiar with Kingdom Wars, but we are guessing that she is more useful in this version of the game (despite the fact that "Wisdom" is powered down) than in the original San Guo Sha because there are other Shu characters with abilities that allow them to easily recover health. If you are using her in QSanGuoSha, store Peaches whenever possible and try to take damage whenever you can so you can use them to activate "Wisdom."